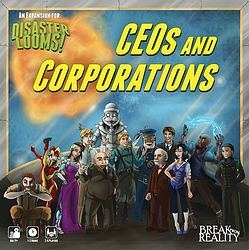 CEOs & Corporations, the first official expansion for Disaster Looms! includes all the things you need to play with 5 or 6 players, as well as all new exploration tiles, events, and technologies to provide new random variations to your game. Be the first to Salvage the Ruins of an Artificial World or take advantage of ominous Scientific Experimentation to fund your CEO's selfish goals.